The member portal is a powerful tool adding functionality to your fitness club’s website. These functionalities allow members to interact with your club online. And, they also make you and your member’s lives easier, by linking seamlessly with GymMaster. The member portal is a snippet of code which can be embeded into your existing website in minutes. This code creates the portal on a page within your site, providing your clients a seamless user experience. The GymMaster member portal gives you the ability to allow prospective members to sign up for memberships, set up their payments and make bookings for classes and personal trainer appointments directly from your fitness club’s website. Removing unnecessary barriers to completing these tasks (such as phone calls or physically visiting the club) improves the probability of your club making revenue. Organise your staff schedules to match new bookings. With the portal installed, it’s simple for members to view the availability of classes and personal trainers when making bookings. This way you no longer have to worry about overcrowded classes and turning people away at the door. Members signing up to classes within the portal may be informed on changes or cancellations via SMS or Email within GymMaster. Keep members who have signed up to classes within the portal informed on changes and cancellations. This is done with the click of a button within GymMaster. As with any part of life, unexpected interruptions like illness or injury can get in the way of your plans. The member portal allows members to cancel bookings which they can no longer attend. Freeing up slots for others, staff schedules are also updated to match. In doing so, you’re not going to have as many empty classes or ghost training sessions to worry about. Members can access your club’s portal from anywhere and at any time. This convenience allows members to make bookings when it suits (or when they’re feeling motivated). Which, in turn, ensures your club is getting the most engagement as possible. 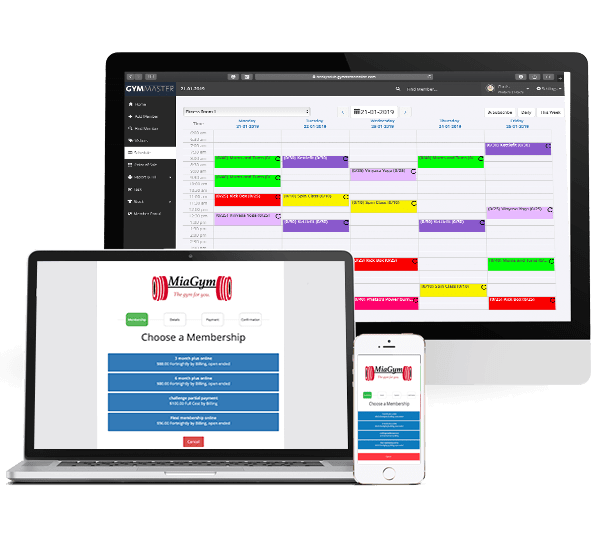 Within the portal, clients can view information of all the classes, resources and personal trainers in detail before making bookings. This way they can see all of their options and make the best decision to suit them. Do your classes or training sessions have associated charges? Members can sign agreeing this to be added on their next bill or pay when they turn up for class. 6. Members Need Time Away from the Club? No Problem! Illness, injury or holidays may hold members back from working out, but it doesn’t need to hold back your gym! Along with rescheduling and cancelling bookings, clients can organise memberships from their member portal so you don’t have to. Putting memberships on hold and organising payments can all be done within your fitness club’s website. But the best part is, it’s completely hands off for administration staff! If you have any questions about the member’s portal, please feel free to reach out by emailing help@gymmastersoftware.com. You can also book a demo here if you would like to see it in action.